Basic stained glass jewelry making for the beginner. Create and design your own stained glass jewelry using glass nuggets, beads, old jewelry, glass chips or pre-cut stained glass designs. Learn how to incorporate wire and hardware to make unique designs. Instructions on basic tools and how to use them. 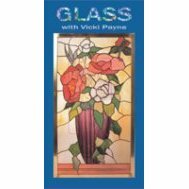 As a bonus, Meg Licursi from Gallery Glass shows how to make faux stained glass windows using lead adhesive and paint. VHS 30 mins.